22 Games from Another World! 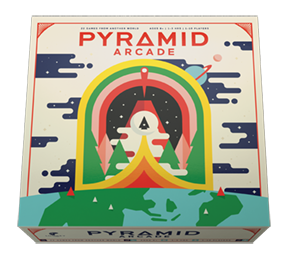 Pyramid Arcade is a complete game library in one box. Inside, you'll find everything you need to play 22 different tabletop games, each of which uses the Looney Pyramid gaming pieces in a different way. The games in this arcade range from easy to complex, from mostly-luck to pure skill, and from time-killer to brain-burner. 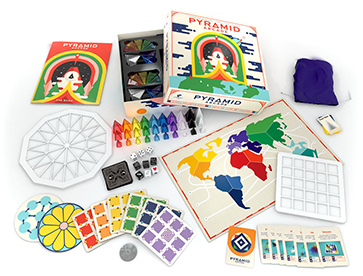 Developed over the course of more than twenty-five years, the games in this set are truly out of this world! The instruction book in Pyramid Arcade has detailed instructions to play the following 22 games: Ice Dice, Zark City, Color Wheel, Black Ice, Twin Win, Treehouse, Petal Battle, Launchpad 23, Volcano, Hijinks, Ice Towers, Lunar Invaders, Verticality, Homeworlds, Powerhouse, Looney Ludo, Pyramid-Sham-Bo, Give or Take, World War 5, Petri Dish, Martian Chess, and Pharaoh. Thank you to the Retailers who supported our Kickstarter! We made a short run of Pyramid Arcade Loonacy with these game patches! Box Dimensions: 11.5" x 11.5" x 3"